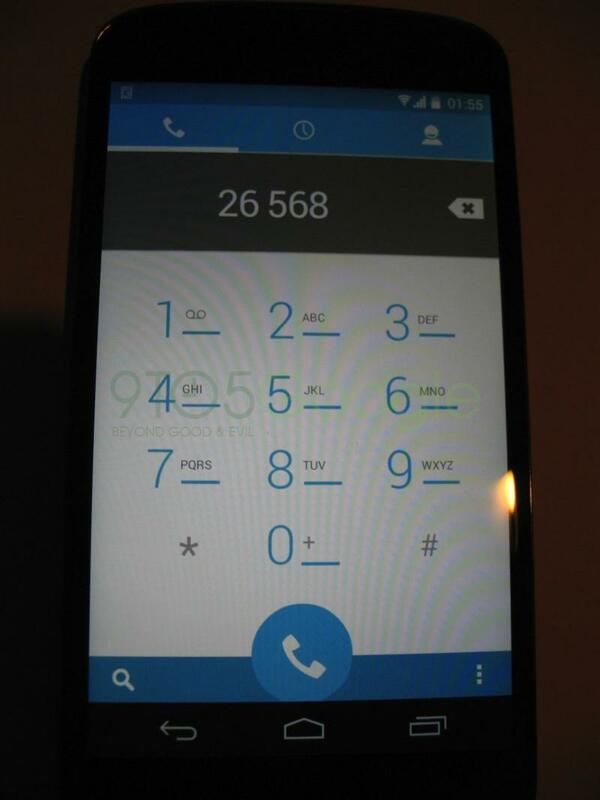 The Nexus 5 isn’t much of a secret. Over the past several months, a number of detailed leaks have revealed a device that could turn out to be the best Android handset this year—and that’s saying a lot. We’ve seen plenty of terrific smartphones from a number of different sources throughout 2013; the HTC One, the Galaxy S4, and the tragically under appreciated Moto X. Android users aren’t short of choices, that’s for sure, though if what we think we know about the Nexus 5 turns out to be true, it has the characteristics to be the strongest Android phone ever. And it could be insanely cheap. I know. I can’t wait, either. The design of Google’s Nexus line has fluctuated throughout the years, jumping between flimsy plastic to casings of glass. The most recent model, the Nexus 4, featured a pretty terrific glass design (think iPhone 4/4s), though many users complained it was too fragile, and often damaged under normal stress of everyday use. A few months back, it wasn’t clear whether the next Nexus would follow that same design (just bigger)—it wasn’t even clear which manufacturer was tapped to make the device—though recent leaks show the handset will indeed sport a soft-touch back. Build quality has become a huge selling point in today’s market, and it appears the Nexus 5 will compete among some of today’s best. If it’s anything like LG’s G2, which TechnoBuffalo recently reviewed, Google’s next flagship hero will feel just fine in the hand; the decision to opt for a soft touch material will make the device appear more premium, while still retaining qualities of durability. Google’s latest Nexus 7, which features a beautiful soft touch rear shell, is a shining example. 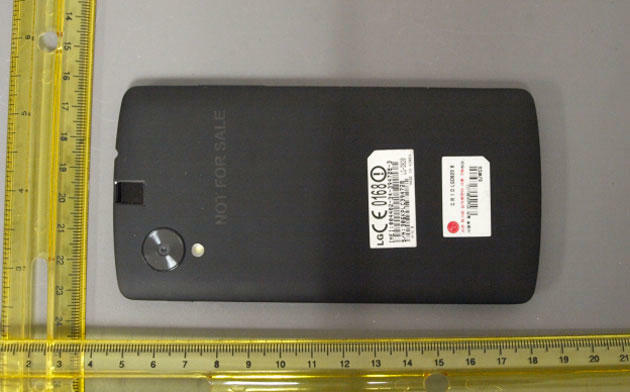 On the front, it sure looks like the Nexus 5 will size up to match some of today’s most popular handsets; the latest spec leak suggests the device will sport a 5-inch Full HD display (441 PPI), a definite upgrade from last year’s Nexus 4, which had a 4.7-inch 720p screen. The screen won’t just be bigger, however; judging by the many leaked shots we’ve seen, the display should have minimal side bezel—and since Google favors onscreen buttons, minimal bezel on top and bottom as well. Otherwise, the not-so-mysterious handset will look like many other black touchscreen devices we’ve become accustomed to: headphone jack on the top, microUSB connection on bottom, and power/volume buttons on the side. Instead of featuring horizontal branding, it looks like the Nexus 5 will mirror the change we saw in this year’s Nexus 7, with branding that runs up the device’s spine. 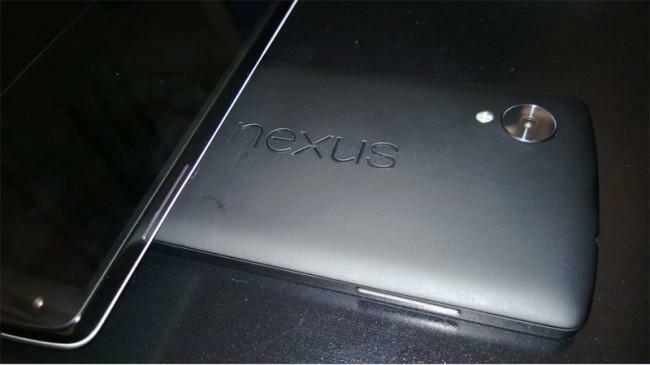 According to a leaked service manual (which has been removed due to copyright infringement) from earlier this week, the Nexus 5 could sport some major flagship specs. In addition to that 1080p display, it looks like the handset will come equipped with a 2.3GHz Snapdragon 800 processor, 2GB of RAM, 8-megapixel rear camera, NFC and wireless charging. Let’s stop a second to let that marinate. Even fans of Samsung devices, which consistently have the latest, most bleeding-edge specs, will be fawning over the Nexus 5’s potential. It sounds nothing short of amazing. Not only will it be fast, and compatible with plenty of networks here in the U.S., it should feature the latest version of Android, which we’ll get to in a minute. Other possible specs include a 2,300mAh battery for the 16GB model, 3,000mAh model for the 32GB model, a cavalcade of sensors, notification light, Bluetooth 4.0 and Slimport compatibility. Compared to many existing top-end smartphones, it certainly competes spec-for-spec, which hasn’t always been the case with past Nexus devices. Essentially, the Nexus 5 sounds like a much more refined G2—all the muscle without the very unnecessary LG software tweaks. 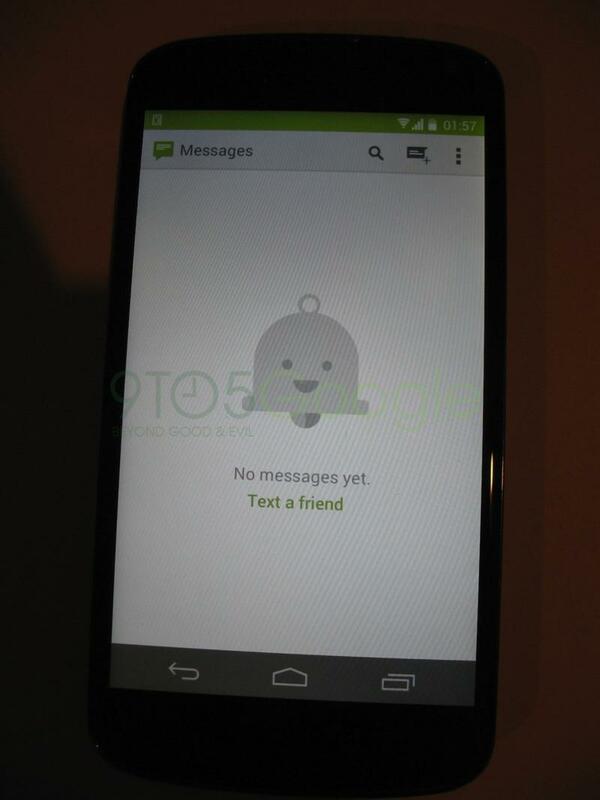 Unfortunately, the camera could be huge thorn in the upcoming device’s side. While it appears the device will sport a bigger lens and some software tweaks with Android 4.4, rumors suggest it’ll still be the one we saw featured inside the Nexus 4, which, as many remember, wasn’t very good at all. The quality could improve with some internal refinement, but we’re not holding our breath. Google shocked the collective tech world in early September by unexpectedly announcing a partnership with Nestle. Instead of using the Key Lime Pie moniker that had been rumored for ages, the search giant revealed it was going with KitKat, which Google admitted is a more appealing treat. Google explained it would use the familiar name, and enjoy the benefits of a little shameless cross-promotion—a win-win for both Google and Nestle. And a move not many people saw coming. Not even Google expected the deal, with many early references to the next version of Android labeled as Key Lime Pie. While we know pretty much every detail about Google’s new phone, we know very little about what to expect with Android 4.4. 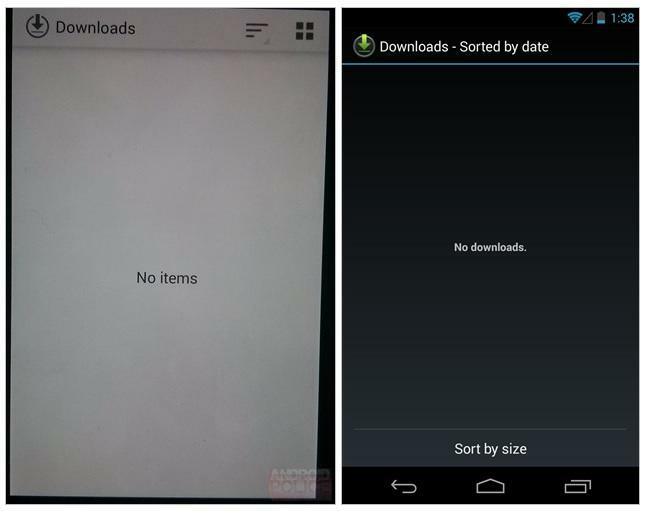 Since evolving up to Jelly Bean (Android 4.1) Google’s mobile software has added little nickel and dime features over the past year and some odd months. But nothing truly huge has hit the platform since; Jelly Bean has been the company’s biggest mobile triumph. From what we’ve seen leaked out thus far, however, it seems Google will focus mostly on tweaking how Android looks, with the typical slew of under-the-hood changes for even greater optimization. It looks like KitKat will introduce a transparent navigation bar, revamped app drawer and a different way to access widgets (long-press instead of hiding in the app drawer). The most intriguing and informative piece of information about Android 4.4 actually came when the software was first announced. “It’s our goal with Android KitKat to make an amazing Android experience available for everybody,” Google said, suggesting the company may have devised a way to end fragmentation once and for all. Fragmentation isn’t quite as prevalent on today’s big handsets—Jelly Bean itself is on quite a few handsets these days—though issues still do remain. If Google has found a way for users to more easily access the latest Android version—without the intervention of carriers and OEMs—it’ll squash one of the platform’s biggest criticisms. This week, we’ve seen the possibility of a tweaked Downloads UI, and also suggestions Google is integrating both SMS and MMS into its Hangouts messaging client, which was introduced a few months back. It also sounds as though there will be an always-listening mode, a la the Moto X, though it’s unclear how deep that feature will go. Otherwise, other possible additions include a tweaked camera app, new dialer and Google Drive and Google Keep apps installed by default—more apps to keep you inside of Google’s ever-expanding ecosystem. Will there be deeper changes? Sure, probably. But what? 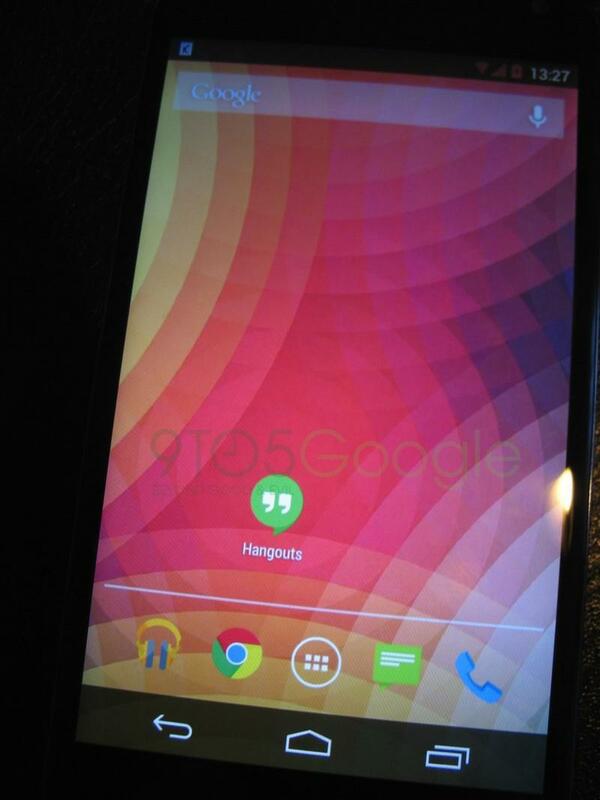 There’s no denying the Nexus 5 is shaping up to be a killer smartphone. Google’s Nexus lineup has improved in strides with each successive version, but this one might finally put it among the upper echelon; it might cross Nexus directly over into the mainstream, which could be hugely worrying for Android OEMs in the longterm. 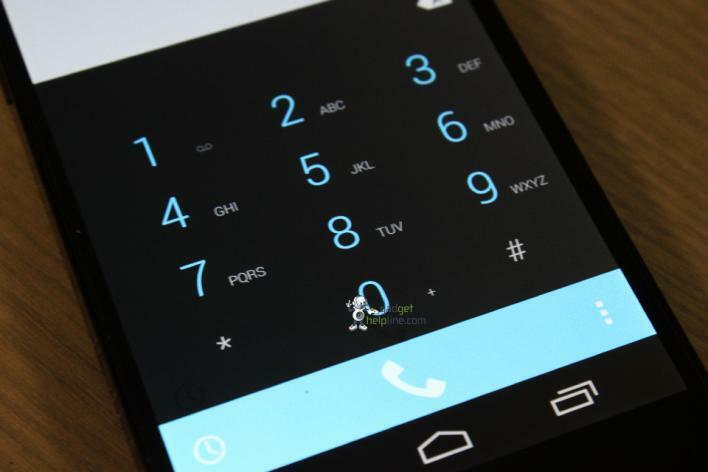 In a recent report, a tipster claimed Google would offer the device—unlocked—for just $299. Some of today’s flagship devices are just as much with a two-year contract, highlighting an obvious and stellar benefit to choosing the Nexus line. Want more storage? Just add another $100, bringing the total to $399—that’s still off-contract. The initial lump sum might make a few buyers wince, but when you consider a device like the Note 3 is $299 after subsidy and two-year deal, the Nexus 5’s value becomes immensely enticing. For the kind of specs and build quality on display, the price might be too good to pass up—hopefully there’s no catch—no matter how curved or how aluminum competitors get. There are some big pros and cons to vanilla Android software, and many manufacturers have actually managed to add some really valuable tweaks to the platform over the years. But if these rumors turn out to create a Nexus 5 that has both specs and a killer price, there could be a lot of HTC One, Galaxy S4 and LG G2 owners with some major buyer’s remorse. 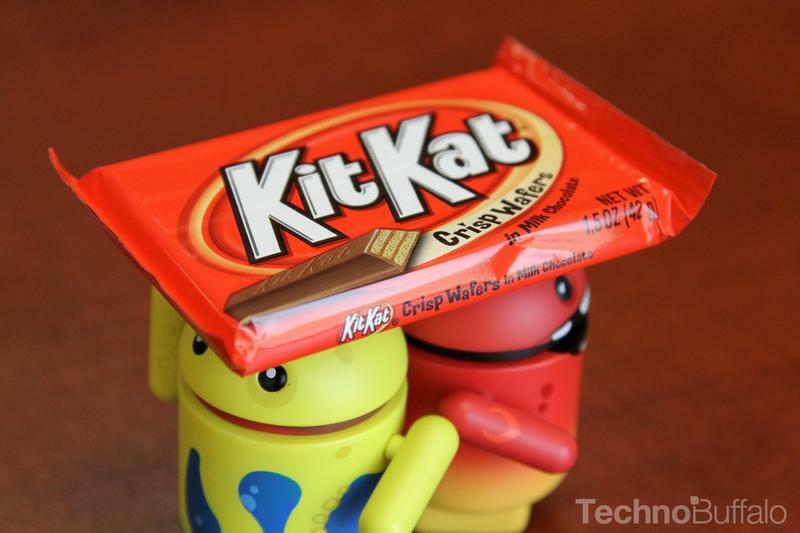 Google will reportedly unveil its Nexus 5 and Android 4.4 KitKat at an event on Oct. 15, which is just around the corner. Until then, I’m sure we’ll see a few last minute leaks as we head into the weekend and on into next week. 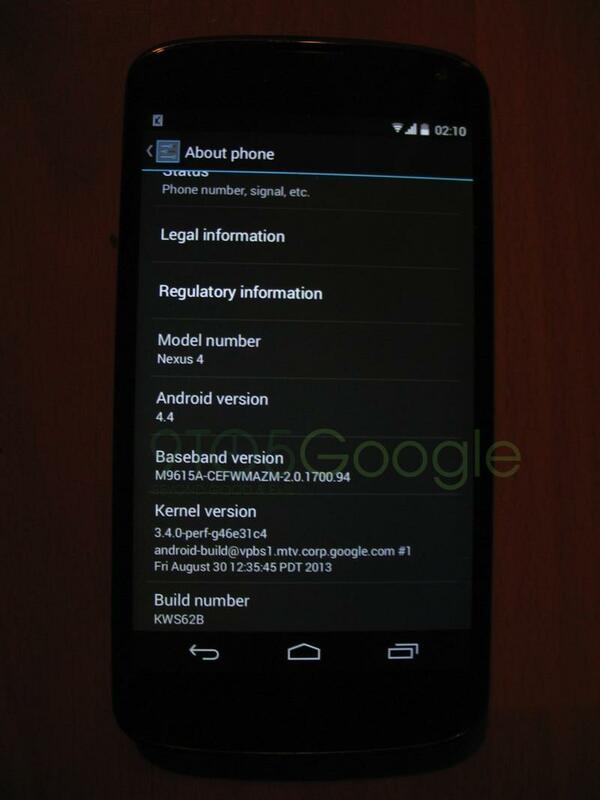 What has you most excited about the Nexus 5?